There’s a definate chill around the house tonight, so much so that my toes are cold inside my socks, and we’ve put the heating on. I don’t mind so much, I’m starting to get ready to embrace the cooler weather; I bought some cotton tops from Marks and Spencer yesterday (I’ll be layering for warmth this winter) and I’ve just ordered another pair of the Ugg boots I love so much. They’ll keep my toes snug and warm. 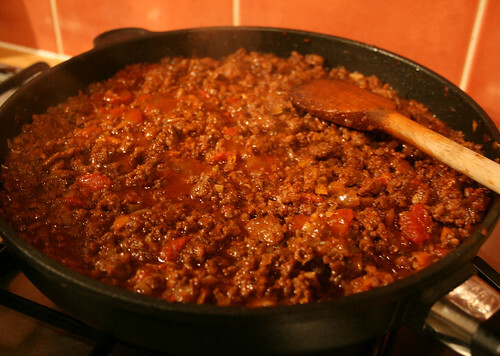 The bolognese sauce I’ve made is simmering away nicely now and its smell wafting under my nose as I sit here on the sofa is both appetising and comforting. 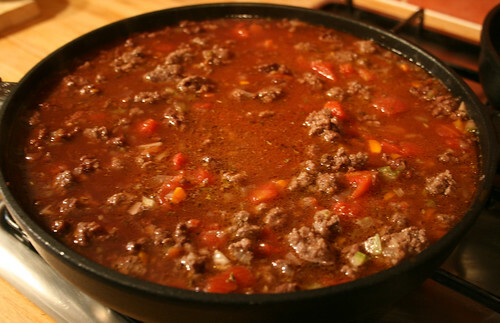 I simmer my sauce gently for a couple of hours, if I can wait that long, which deepens the mingling flavours, tenderises the meat beautifully, and thickens and enriches the sauce. I use port in my recipe, which gives it a wonderful depth and sweetness that I love. 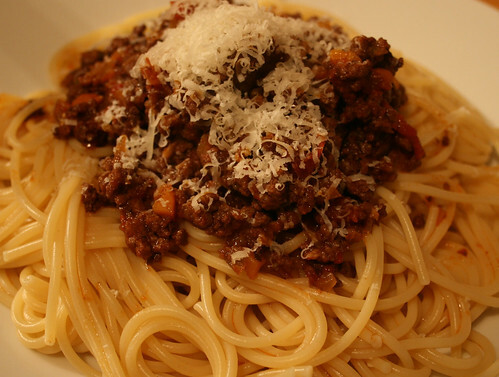 Unauthentic that may be, but then so it the whole concept of Spaghetti Bolognese, which actually isn’t Italian in origin but is a foreign interpretation of the Italian sauces. Nethertheless, I adore it, it was a favourite in my younger years when my Mum made it and it’s a favourite now. It’s a perfect family meal; mounds of spaghetti topped with thick, meaty sauce and a huge chunk of parmesan to pass around and excessively grate into gloriously pale yellow curles falling on top of your plate. 1. 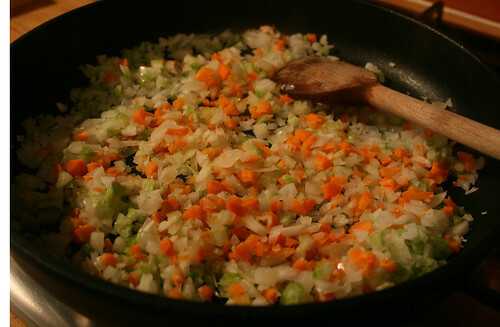 Sauté the finely chopped onion, celery and carrot until soft. 2. 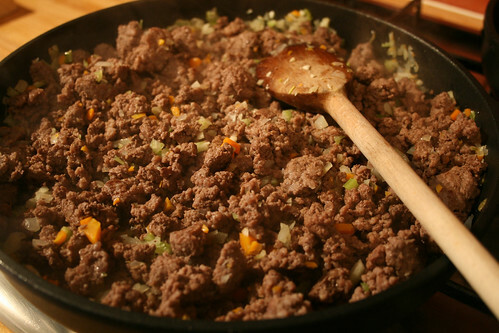 Brown the mince well and add it to the vegetables. 4. Bring to the boil, then turn the heat down and simmer very gently, so that there is only the occassional bubble on the surface of the sauce, for two hours, topping up with water if the sauce starts to dry out. 5. 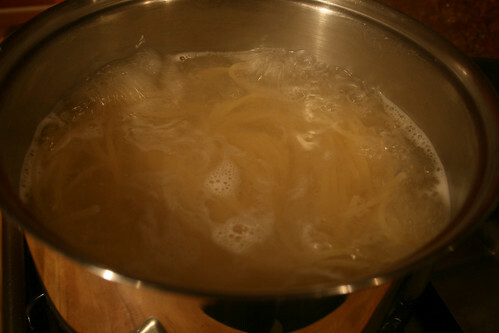 Cook the spaghetti in salted water until al denté (which means it has a bite to it, ie it’s not completely soft all they way through, but still a little firm in the middle). 6. Season the sauce and serve it on top of the spaghetti with parmesen cheese grated over.